Pillsforall.com is an established internet drugstore that started operating in 2003. It has offices in Europe. Among the basic principles used by this website in its day-to-day operation are sincerity, transparency, and creativity. The list of drugs offered by Pillsforall is long. They have different brands of medicines that can help to boost libido, muscle relaxants, antidepressants, antianxiety drugs, antibiotics, drugs to treat breast cancer and gynecomastia, drugs to lower cholesterol, hair loss treatment, impotence, pain relief medicines, prostate drugs, and medicines to help you sleep. After searching the website for a few minutes, we were unable to find erectile dysfunction or libido booster products. We checked under the muscle relaxant category but what we found is Valium. On their main page, Pills for All has a post about Sildenafil Citrate. It is not clear if they just don’t have sildenafil citrate products as of this writing (out of stock perhaps). Ordering from Pillsforall.com can be completed by paying with a Visa Card or Bitcoin. On their page, it says they only accept Visa Credit Card. With the increasing popularity of Bitcoin, Pillsforall.com has joined the bandwagon of online stores who are now accepting it as a payment option. All orders are delivered via Registered Air Mail. All orders are shipped on weekdays. Processing of order takes up to 48 hours. Depending on the delivery address, delivery time can take up to 10 days (the shortest) while some can take up to 30 days (the longest). Pillsforall.com advises their customers to contact the support team if they ordered their medicine and has not received their order after 21 days. Pills for All can be reached via their contact us page. If you have queries or questions, you can send them a message to [email protected]. They also have a live chat support team that can answer your queries any time of the day. This e-dispensary offers reshipping of orders free of charge in case the order gets lost, damaged or missing. All orders are packed discreetly and it requires a signature during delivery. Since 2003, Pillsforall has been offering and delivering medicines to their customers. They deliver over the counter and prescription drugs to their customers. With customer opinions and branding affecting a business, Pills for All has been striving hard to continue receiving good reviews from their customers. In the last 15 years since they started, here are some of the reviews they received so far. 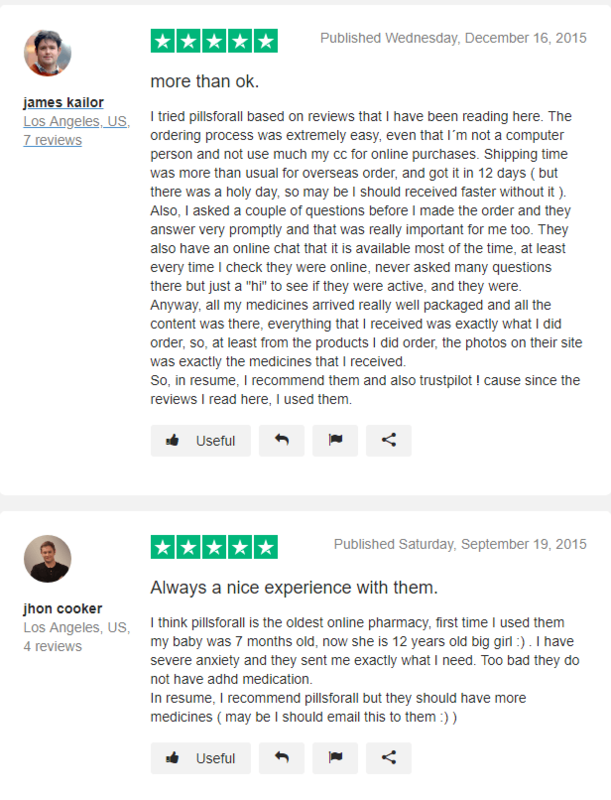 James Kailor from the US is a verified online pharmacy user who gave Pillsforall.com a rating of 5. He said that this store is more than okay. James shared that he only tried Pills for All after reading some user reviews. Some of the things that James appreciated were the easy to use website and the shipping time which was 12 days. For an international shipping, James said it was remarkably fast. Prior to placing his order, James talked to their support team and all of his queries were answered. John Cooler, another happy camper of Pillsforall said that he had been ordering from this e-dispensary since his baby was 7 months old. Her daughter is now 12 and he is still using Pillsforall.com to refill his anxiety prescription. He said that his daughter has ADHD but Pillsforall does not have ADHD drug available and he wished they will offer it soon. James and John are just happy to use Pills for All and for the last few years since they used, they seem to be satisfied with the service and product they are receiving. Since 2003, Pillsforall.com has continuously received good reviews from their customers. It is indeed a challenge to any store to prove how reliable they are and one way to do so is by staying in the business for a year. How consistent is Pillsforall in providing excellent service? According to Bobby and Katrina, this e-dispensary is an old e-store and they are old customers. Bobby has been using Pillsforall.com for the last three years and he was happily using them because the medicines they offer are not fake. As for Katrina, she always has questions before placing an order and luckily, Pillsforall always reply to her email queries. All of her orders were delivered within 7 days and they all look the same. 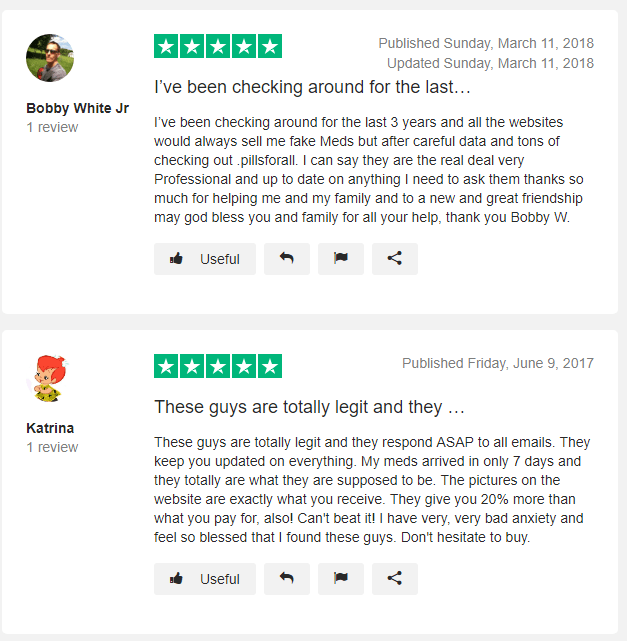 Bobby and Katrina are just two of the happy customers of Pillsforall.com and they are saying the same thing – they can rely on Pillsforall.com when it comes to refilling their prescriptions. Pillsforall.com is currently not offering a coupon code. What you can find in this website are on-sale medications such as Valium Ativan, Xanax, Lexotanil, and Ultram. These medicines are offered with up to $100 off the regular price. Aside from discounted medicines, Pillsforall promises to deliver your order at the fastest time possible. Pillsforall.com is a European online pharmacy that started operating in 2003. It has been serving its customers for the last 15 years. As of this writing, they do not have erectile dysfunction medicines on their shelf to offer. What they have are other popular drugs such as Xanax, Ambien, Dormicum, Valium, and Ativan. To process an order, you have to create an account with Pillsforall.com. After creating your account, you can check the drug you need and if it is available, you can proceed with your order. The only mode of payment accepted by Pillsforall.com is Visa. A few months ago, they also started accepting Bitcoin for payment. 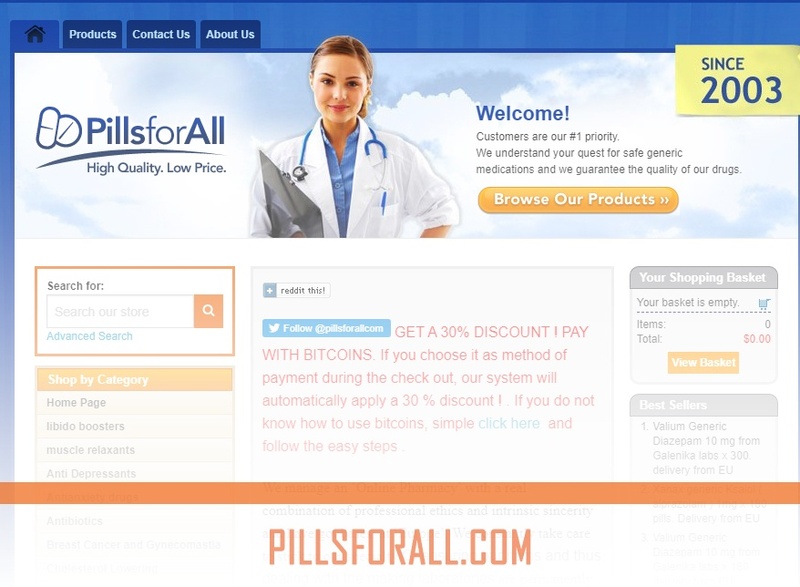 Pillsforall is one of the first online pharmacies that accept Bitcoin for payment.